The CDH 1813 is a versatile, compact SDI to HDMI converter designed to combat a host of monitoring and display applications in broadcast, post production and pro A/V markets. Convert any SDI video signal, including 3D formats into HDMI signal for monitoring and display. The CDH 1813 is a versatile, compact SDI to HDMI converter designed to combat a host of monitoring and display applications in broadcast, post production and pro A/V markets. Convert any SDI video signal, including 3D formats into HDMI signal for monitoring and display. Fiber connectivity options add SDI fiber transmission and/or SDI fiber reception using the integrated fiber SFP socket. Two channels of audio can be de-embedded providing digital AES and analog audio outputs. Analog audio outputs have selectable full scale range presets. The two selected audio channels can also be embedded into the HDMI output. In addition 8 channels selected from the input signal (channels 1-8 or 9-16) can be embedded into the HDMI output. Various burn in features make the CDH1813 a true monitoring tool. Timecode burn in, 16 channel audio metering, safe area markers and Metadata display are just a few of the on-screen monitoring features. 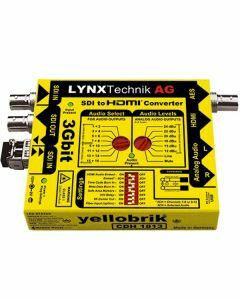 The yelloGUI software provides support for a host of additional settings and features which are accessed using a PC and the USB port on the module.